Answer String: Enter the length in cells of the horizontal loop segments from left to right in the marked rows, starting at the top. If the loop only has vertical segments in the marked row, enter 0. Separate each row’s entry with a comma. This example has the key “2,21”. 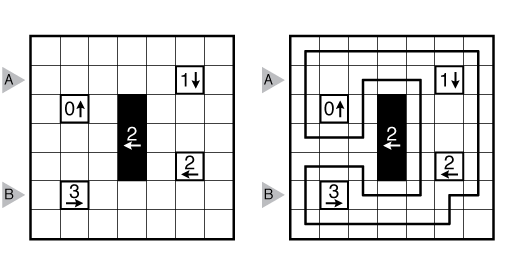 (Brief) History of Castle Wall: Castle Wall is an original loop puzzle style created by Palmer Mebane in 2009; the first examples were posted on his blog Melon’s Puzzles. History of this example: This Castle Wall was written by Thomas Snyder. Sources for Castle Wall: Follow this link for more Castle Wall puzzles on this website and this link for other Castle Wall puzzles from Palmer Mebane’s old blog. More Castle Wall puzzles can be found in our beginner-friendly collection Intro to GMPuzzles as well as the larger collection Castle Wall, both by Serkan Yürekli. Design rules for contributors: A Grandmaster Castle Wall will have a unique solution that can be reached by logic alone. Generally, a Grandmaster Castle Wall should have clue symmetry, or an interesting visual/logical theme if there is no symmetry. Sizes from 10×10 and above are recommended (maximum aspect ratio of 2:1 if rectangular).